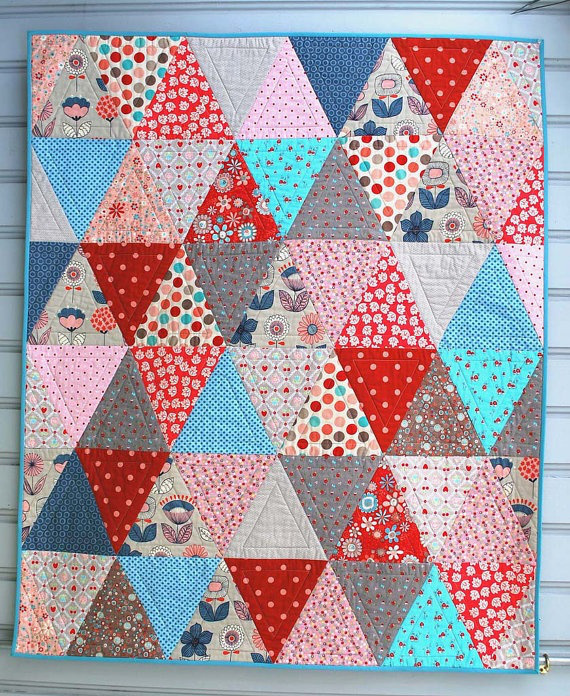 This cute quilt is quick, easy, and customizable. Use up scraps, or bring together some new favorites. Continue the pattern to create a larger sized quilt if you like. 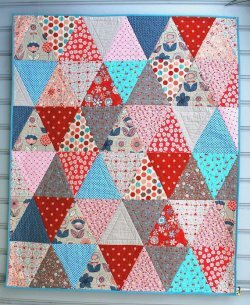 You can easily quilt the triangles too! The original article includes a link to a tutorial on creating perfect triangle points. "This is one of my very favorite quilts that I have ever made and just happens to be one of the easiest and quickest to finish. I even did the machine quilting myself on my regular Pfaff machine. It was featured years ago in the Better Homes & Gardens magazine Quilts and More, but since it is now retired from that, I have decided to add it to our Free patterns. It is a great go to quilt when you have a beautiful collection of fabrics that hold their own and you don’t want to chop them up too much. Or if you just want to showcase some favorite prints together. This quilt is a combo of designs I loved from 3 of my favorite fabric companies, Adornit, Riley Blake & Alexander Henry."